Learn more about the Flir ONE Pro USB-C Thermal Imaging Camera with pricing, a list of features, and frequently asked questions. 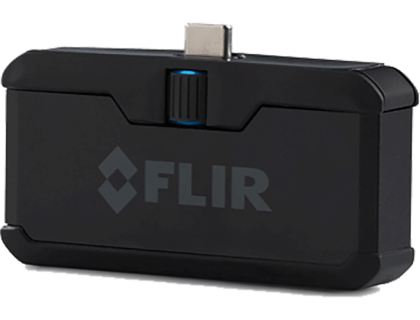 The Flir ONE Pro USB-C Thermal Imaging Camera is a thermal camera that connects directly to Android smartphones. With the compact Flir ONE Pro, you can turn your Android into a thermal camera and capture heat-sensitive video or images instantly. The Flir ONE PRO USB-C Thermal Imaging Camera costs $199.99. Pros: Compact. Works in any lighting. Bottomline: A quick and easy tool for thermal imaging that anyone can use. What range of temperature can the camera detect? The Flir ONE can detect temperatures from -20 °C to 120 °C. Are there any updates for the camera? You can download updates through the Flir ONE app. Updates are available after you set up the app and register your camera. What are some Flir ONE Pro USB-C alternatives?